As I am recovering from my post-wedding and honeymoon blues, I figure the best way to truck through is to reminisce about the absolutely incredible journey my husband and I experienced in Italy. Planning our honeymoon in Italy with TourCrafters was something that seemed to be a dream; something that was a fantasy rather than a reality. Now, having returned to Chicago from this remarkable and delicious trip, it is still difficult to believe that it was a reality. We spent three weeks in Italy—eating, drinking and touring our way through the Amalfi Coast, Rome, the Tuscan country-side, Florence, and Venice. Many times since we’ve returned, we’ve been asked, “What was your favorite part of your trip?” And, the truth is, that question is impossible to answer. One cannot compare the peaceful serenity of the Amalfi Coast, the historical liveliness of Rome, the rustic beauty of Tuscany, the artistic treasure of Florence, and the magical luxury of Venice. It is hard to believe that such diverse and equally breathtaking splendors exist in one country. Driving along the windy coast of Amalfi, you tend to forget that it is a reality. The beauty of the Amalfi Coast is truly remarkable. At the beautiful Hotel Due in Maiori, we opened the back door of our room, which was more reminiscent of a villa with its beautiful ceramic floors and bright blue and yellow colors, we opened to the vast crisp blue water. Our days in Maiori were filled with relaxation and sightseeing. We had the luxury of spending every morning having breakfast on the terrace of the hotel overlooking the sea. A couple days we spent walking around the town, laying on the beach, and exploring the tiny treasures of ceramic shops, but we also took advantage of the adventurous opportunities that were nearby. The ferry that could take you along the rest of the towns along the coast was the perfect travel convenience. One day, we took the ferry and boat to Capri. Known to be the island of the stars, Capri is as picturesque as it is a shopper’s fairytale. Lined with designer stores, the small, stone streets of Capri wind into hidden openings where you are atop the island looking over the blue sea. The venture to Capri is perfect for the day, as one can walk the around the island and discover its hidden gems, or rent a boat and enjoy the day in the sun. Another day, we arranged a tour, through TourCrafters, of Pompeii – the historic city that was destroyed by the eruption of Vesuvius in AD 79. Partially buried, Pompeii is an indescribable gem of history. Walking through the streets of the once-thriving city, we were overwhelmed with the brilliant elements of architecture that are comparable to that of Ancient Rome and Greece, but undoubtedly unique in its own characteristics. 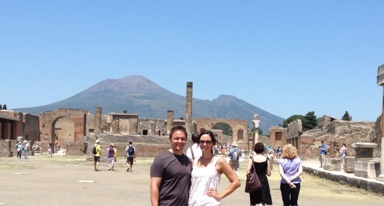 Having our own private tour guide gave us the opportunity to walk Pompeii and bring history alive. Wandering through villas, restaurants and amphitheaters, nothing could prepare us for the exceptional Forum, where one could clearly see the overcasting Vesuvius creeping over the city. On our return from Pompeii, we took a guided driving tour back to Maiori through the coast of Amalfi, driving through cities including Sorrento, Positano and Amalfi. These towns are magical in their own right and historically fascinating, and driving through them gave us a little taste of the dream that is the Amalfi Coast. Next Post GO SAN FERMIN! treated to a fancy meal at their homes on the rooftop! It is very simple to book a dinner with the hosts on their website too! Other than that, I would also suggest you to try taking one of those Vespa tours, especially in the Florence country-side. Riding on the vespa with your partner across the green landscape is actually very thrilling and romantic! Hope this helped! Sanai, Thank you for your wonderful feedback. Italy is so wonderful and romantic.Rome & Florence have to be my favorite too! There are always new things to see and the people are wonderful. Keep your posts coming. Let me know if you would like to see more of a certain destination or subject. Are you planning on another European getaway soon? Let us know!